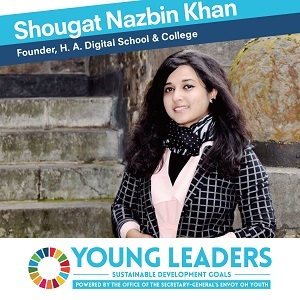 The Young Leaders for the Sustainable Development Goals are 17 global citizens who have been recognized for their outstanding leadership in their efforts to achieve the Goals. The 17 were selected from more than 18,000 nominations and will work with the Office of the UN Secretary-General’s Envoy on Youth on efforts to engage young people in the realization of the Goals. Trisha Shetty, a 26-year-old from India, launched SheSays in 2015, a platform to educate, rehabilitate and empower women to take direct action against sexual assault in India. SheSays uniquely provides tools and resources for women, including access to legal, medical and psychological support. “I decided to do something when I realized that I could go online to find information about restaurants, but for victims of sexual abuse, there was nothing.” One year later, “SheSays” was born. A non-profit organization with a full team of “fabulous” under-25s, SheSays provides a portal that educates, rehabilitates and empowers women to take direct action against sexual violence in India. Trisha and her team work with established institutions across the education, entertainment and healthcare sectors to build a network of support that recognizes all levels of sexual abuse and provides the necessary means to fight it. So far, the organization has successfully engaged more than 60,000 young people through educational workshops at urban universities, their website, and music festivals as part of their endeavor for the public safety of women. Anthony Ford-Shubrook is a 30 year-old from the United Kingdom and a lifelong advocate for disability rights and access. At age 17, Anthony made legal history when he successfully lobbied to attend college in London. As the Youth Representative of AbleChildAfrica, he campaigns for youth with disabilities to live full and independent lives everywhere. 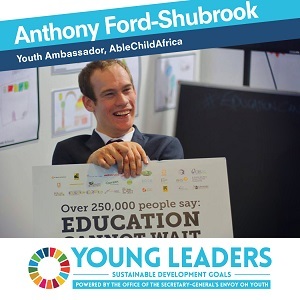 Born with cerebral palsy, Anthony Ford-Shubrook is determined to empower people with disabilities from all walks of life: “I never let my disability prevent me from achieving my goals.” At age 17, Anthony proved this when he made legal history in the UK. While he was initially disallowed from attending college in London because using a climbing wheelchair would pose a health and safety problem for other students, Anthony successfully lobbied to attend, laying the groundwork for the Special Education Needs and Disability Act. At 25 years old, Rita Kimani of Kenya is the co-founder of FarmDrive, a social enterprise that connects unbanked and underserved smallholder farmers to credit. To date, FarmDrive works with over 3,000 farmers and is dedicated to financial inclusion. “I grew up in rural Kenya where the people are dependent on farming. My mom was fending for a family of four, and I witnessed other families struggle to support themselves through agriculture, in part because there was a lack of financial inclusion.” Despite these challenges, the 25-year-old computer scientist has seen how sustainable agriculture can be a vehicle for inclusive economic growth and resolved to use her experiences to find solutions. 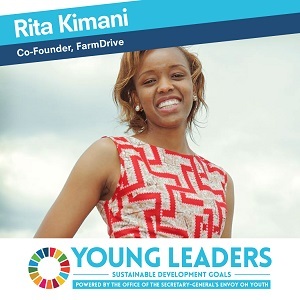 Rita co-founded FarmDrive, a social enterprise that connects unbanked and underserved smallholder farmers to lines of affordable credit in rural Kenya. Using mobile technology, FarmDrive’s platform enables farmers to track their productivity, expenses and revenues to create comprehensive credit portfolios enabling access to affordable financial services, as they are needed. As it stands, 3000 farmers are registered, and loans have been facilitated to 400 farmers. Rita and her co-founder intend to scale-up fast. They forecast 210,000 loans will have been processed by the end of 2018; and half a million Kenyan smallholder farmers will benefit from FarmDrive’s services within five years. 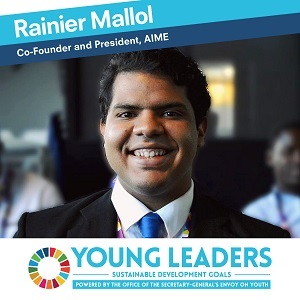 Rainier Mallol is a 25-year-old from the Dominican Republic. He is the co-founder and President of AIME, an epidemiology company that has developed a tool to predict major disease outbreaks by using artificial intelligence, epidemiological expertise and data analytics. Every year, 2.5 billion people are at risk of catching Dengue fever and 400 million of them actually do. “Growing up in the Dominican Republic, the number one health concern we think about is Dengue,” reveals Rainier. “My mother and my brother have both had it.” Struck by this, Rainier – who is a computer engineer by training – was determined to find a solution when he co-founded AIME (Artificial Intelligence in Medical Epidemics). Edda Hamar, a 27-year-old from Iceland and Australia, co-founded Undress Runways, building a movement pushing for sustainability and ethics in the fashion industry without compromising style. Edda also launched The Naked Mag in 2014, advocating for diversity, respect, equality, sustainability and smart textiles in the fashion industry. “Our purpose is to educate consumers about sustainable fashion and to change the stigma around it,” says Edda. 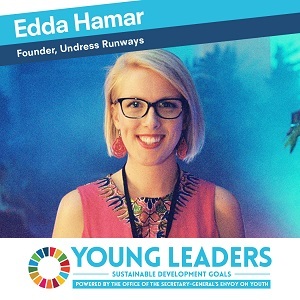 As co-founder of Undress Runways, Edda has built a movement to educate and inspire people to choose ethically and sustainably produced clothing and promote sustainable consumerism, decent work and ecologically friendly fashions. “We are showing people that sustainability is the future, and that you don’t have to compromise your style to be ethical,” she said. Through Undress Runways, Edda leads a multifaceted effort to connect sustainability and fashion. The annual fashion show engages more than 50,000 people celebrating forward-thinking fashion designers from across the globe. The Naked Mag is an annually published magazine that advocates for diversity, respect and equality, and profiles the best of the industry. And ‘VIHN’ is an emerging label designed to create opportunities for mainstream garment workers to move into ethical workplaces. “There’s always a story behind the clothes, and we want people to choose the positive stories,” Edda said. 23-year-old Vincent Loka of Indonesia is one of the three founding partners of WateROAM, a social enterprise developing water filtration solutions that bring rapid access to clean drinking water in disaster-hit locations. One such solution is Fieldtrade Lite, a product that fits easily into a backpack and can filter dirty river water within minutes. “We are committed to bringing clean water to people everywhere,” says Vincent, which is why he and two co-founders, all in their early twenties, launched WateROAM— a water innovation enterprise championing the vision of a world without prolonged thirst. WateROAM is developing water filtration solutions that bring about the quickest access to clean drinking water at disaster-hit locations, and helping to promote social change in rural areas. “I lead the engineering team to develop filtration systems that are simple, affordable, durable and portable,” says Vincent. “We realized that these four pillars are critical when it comes to getting water solutions to the people on the ground.” One of these solutions, otherwise known as Fieldtrade Lite, fits easily into a backpack and can filter dirty river water within minutes. The impact has been significant. In 2015 alone, WateROAM’s filtration systems provided drinkable water for thousands of the victims of the earthquake in Nepal, Cyclone Pam in Vanuatu and the floods in Myanmar. “WateROAM also supplies the filters to non-profit organizations that deliver them as part of their disaster-relief work. Vincent and his team are committed to continuing this work to achieve Sustainable Development Goal 6 on clean water and sanitation. Safaath Ahmed Zahir is a 25-year-old from the Republic of Maldives. She is a leading women’s rights activist dedicated to elevating the role of women in her country. Through her civil society activism, she has pioneered efforts to raise the profile of women’s economic empowerment in the Maldives. “I come from a household of all women, but a society where men are in charge,” a reality that lit a fire in Safaath from a young age. 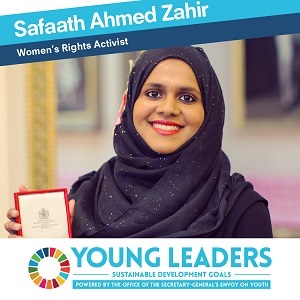 After completing her studies abroad, the 25-year-old “democracy-driven, proud feminist” returned to the Maldives to lead Women on Boards, a non-profit organization dedicated to promoting gender diversity in the workplace and inspiring Maldivian women to accelerate to the next level, no matter their position or economic standing. Through capacity development workshops, scholarship programs and advocacy campaigns, Women on Boards has pioneered efforts to raise the profile of women’s economic empowerment in the Maldives. 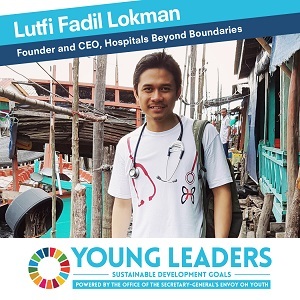 Lutfi Fadil Lokman is a 28-year-old from Malaysia who founded and acts as the CEO of Hospitals Beyond Boundaries (HBB), a youth-led organization with a mission to build healthcare facilities serving underprivileged communities. HBB has trained and served more than 3,000 people in Malaysia and Cambodia. After an accident that left him hospitalized, Lutfi decided to start doing what he had long dreamed of: the 28-year-old medical doctor founded Hospitals Beyond Boundaries, an organization committed to accessible health care through community-run clinics in Cambodia and Malaysia. “I am most proud of our clinic in Cambodia because we focus specifically on maternal and child health,” says Lutfi. The healthcare facilities are uniquely run as social enterprises by the local youth population, trained and then employed as community health workers alongside doctors, nurses and health professionals. Since its establishment, Hospitals Beyond Boundaries has trained and served more than 3,000 people. “We believe that empowerment of the community, rather than charity, is the key to sustainability. We work with local NGOs, the Ministry of Health and local leaders to ensure that we make as much impact as possible.” Other than working directly with Sustainable Development Goal 3 (Good Health and Well-being), the clinic and hospital look at healthcare that lies beyond the hospital boundaries. “When someone is started on antibiotics for pneumonia, we also start looking for holes on his house roof. We hope that by curing diseases, we also help to alleviate poverty.” Not only does Lutfi serve the community through HBB, he also serves as a Medical Officer at the Ministry of Health in Malaysia. Carolina Medina is a 28-year-old from Colombia. Her passion is to make healthy food more affordable and accessible for everyone. 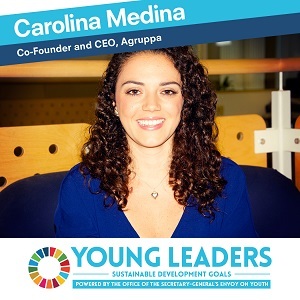 Carolina co-founded and leads Agruppa, a start-up based in her country that leverages mobile phone technology to organize small businesses. “I want to contribute to making my country more equitable for everyone,” a conviction which has led Carolina to co-found Agruppa, a start-up that utilizes mobile phones to economically empower small businesses and lower prices for fresh produce. Agruppa organizes small businesses into clusters, creating collective buying power so that they can benefit from economies of scale when ordering stock. This allows vendors to purchase fresher produce at better prices, saving money which can be passed on to the customer. By creating a virtual buying group among vendors, Agruppa purchases wholesale produce directly from farmers, transports it to the city and delivers it to vendors’ shops. This saves them time and money spent on transportation to central markets where they buy produce, and gives them access to wholesale prices. “The ultimate objective is to make healthy food available to everyone, no matter where they live,” says Carolina. “Hunger in our country does not necessarily mean lack of access to food, but lack of access to affordable and nutritious food. And if kids aren’t properly fed, then they cannot go to school and they cannot learn. We feel that everything is connected, and that is my understanding of the Sustainable Development Goals.” Agruppa currently works with more than 180 “mom & pop shops,” and they are adding between 10-15 every week. Jake Horowitz is a 28-year-old from the United States. He is the co-founder and editor-at-large of Mic, a news and media company targeted toward millennials to capture the unique worldview of this generation. Mic reports original stories and analysis to an audience of more than 30 million people each month, and produces high-quality videos, reaching over 200 million people each month. What started as a two-person operation out of a basement, now employs 160 young staffers and reaches 30 million people every month, 70% of whom are under the age of 34. 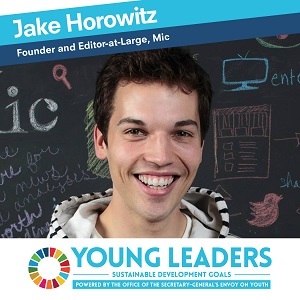 As editor-at-large, Jake leads Mic’s editorial coverage, directing and honing it to reflect millennial issues across the globe. Mic does not just make the news, it spurs young people to take action. Most recently, Mic partnered with Alicia Keys and the We Are Here Movement on a petition to demand racial justice and equality, collecting 120,000 signatures to present to the White House. Shougat Nazbin Khan, a 27-year-old from Bangladesh, established H. A. Digital School & College, now serving 600 students from 50 underprivileged communities in Bangladesh with a focus on socio-economic empowerment of women. “In a community vulnerable to violence, we are giving young people and children real hope for a better future,” says Shougat. Growing up in a family of educators, Shougat recognized the unique role of education in transforming lives. In 2014, she founded the H.A. Digital School and College on her parents’ land in Northern Bangladesh to educate disadvantaged communities with a special focus on the socio-economic empowerment of women. The school has developed curricula that are responsive to rural realities and gender, including ICT and entrepreneurship training, health and environment training, adult literacy and services to end violence. Now in its second academic year, more than 600 students from 50 villages are studying at the school, while 90% of the teaching staff are women. “The rapid growth of the institute has broadened the community’s vision of technology as a tool for developing the skills of young people,” says Shougat. “I believe in this model’s immense potential to promote peace, reduce extreme poverty and uphold environmental and sustainable development.” In addition to her work at the crossroads of women’s empowerment and access to a decent education, Shougat developed a low-cost solar PV irrigation system for farmers for which she won the prestigious Green Talent award in 2015. 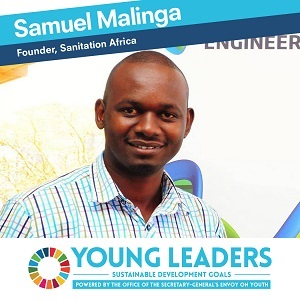 Samuel Malinga is a 27-year-old from Uganda, and serves as the founder and managing director of Sanitation Africa. Having grown up in the Naguru slum, Samuel became determined to increase access to sanitation services in remote and inaccessible communities throughout the country. At the age of 12, Samuel moved to the Naguru slums in the Ugandan capital of Kampala, where he experienced first-hand the systemic problem of poor sanitation and waste management. “It’s so painful to me that children die of preventable diseases brought about by simple sanitation issues that we know how to resolve.” In Uganda, over 95% of the population uses latrines and septic tanks, and 60% of these pits are consistently full in Kampala. Coupled with rapid population growth, the majority of the population resides in unplanned settlements, which are congested and lack proper sanitation. This is why Samuel decided to start Sanitation Africa, through which he developed a full-cycle sanitation system that starts with the building of local low-cost but highly hygienic toilets and ends with the conversion of sludge into cooking briquettes and agriculture manure. Samar Samir Mezghanni is a 28-year-old Tunisian-Iraqi writer with two records in the Guinness Book of World Records as the youngest writer in the world. She has written over 100 short stories for children, published 14 books, and leverages her talent to advocate for youth empowerment in Tunisia and around the world. 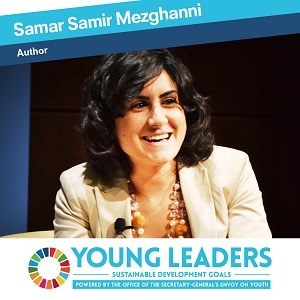 Samar has long explored morality through her storytelling, bringing to life notions such as sustainable development through inter-personal narratives and empowering young people to use their voices. Samar has been named as one of the most Powerful Arab women and one of the 30 Top Arab Achievers under 30. She is currently completing her PhD at the University of Cambridge. 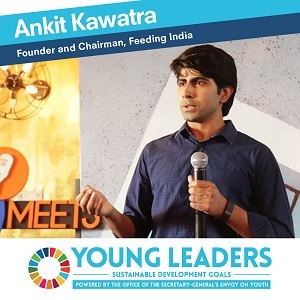 24 year-old Ankit Kawatra founded Feeding India in 2014 to address two issues at once – hunger and food waste. Today, Feeding India has a network of over 2,000 volunteers in 28 cities in India rescuing and redistributing excess food to help feed people in need. The organization has served over one million meals to date and aims to reach 100 million by 2020. Ankit was 22 when he decided to quit his corporate job to focus on tackling food waste and hunger in India. “It all started after I attended a large wedding in the capital of India. I was appalled at how much food was going to waste in a country where 194 million are undernourished,” a reality that spurred Ankit to launch Feeding India, the non-profit organization he founded in 2014. The idea was simple: to collect excess food from parties, events and weddings and re-distribute to people in need. 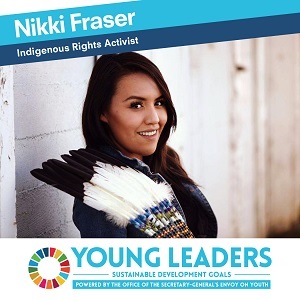 25-year-old Nikki Fraser serves as the Youth Representative from the British Columbia Native Women’s Associations and the National Youth Representative for the Native Women’s Association of Canada. She is a tireless advocate for indigenous women and girls in Canada and worldwide. 19-year-old Karan Jerath is from the United States. Following the Deepwater Horizon Oil Spill near his home in Texas, he was determined to find a solution. 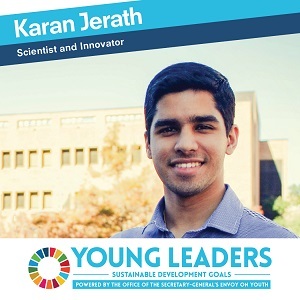 Karan invented a ground-breaking, subsea wellhead capping device that contains oil spills at the source, showing the power of youth as innovators to achieve Sustainable Development Goal 14 on oceans. Born in India and raised in Malaysia, Karan moved to the United States as a “shy and optimistic” 13-year-old. When the BP Deepwater Horizon Oil spill – the largest marine oil spill in U.S. history – happened 30 minutes away from where Karan lived in Texas, he was determined to take action. “I realized that much smaller spills are happening on a daily basis and slowly destroying our oceans and environment. I had to find a solution.” And he did. While still in high school, Karan invented a device that contains oil spills at the source. This patent-pending device can collect oil, gas and water gushing from a broken well on the seafloor, providing an effective, temporary solution in the case of an unforeseen subsea oil spill. For his invention, Karan won the Young Scientist Award at the Intel International Science and Engineering Fair’s 2015 competition, and was selected as the youngest honoree on this year’s Forbes 30 Under 30 Energy list. 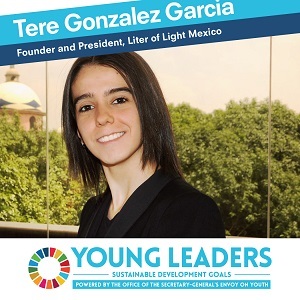 Hailing from Mexico, 29-year-old Tere Gonzalez Garcia is the president of Liter of Light Mexico, part of a global movement to repurpose plastic soda bottles to create sustainable light sources. She is a strong advocate for ecological and low-cost lighting solutions for underprivileged communities around the world. “Without light, your opportunities are diminished,” a conviction that led 29-year-old Tere to start Liter of Light Mexico in 2013 as a joint venture with Fundacion Qohelet, the non-profit organization to prevent violence and addiction that she co-founded at the age of 16. As part o f a global open-source movement, Liter of Light Mexico provides affordable and sustainable solar light using recycled bottles to illuminate homes, businesses and streets. What started out as a small project in Mexico, eventually grew into a full non-profit organization, which Tere still manages today as president and has helped incubate Liter of Light in other countries like India, Spain, Honduras and Guatemala, among others.